On April 24th, 1948 the C.G. Jung Institute Zurich was founded as a non-profit, charitable foundation. Plans had already been made in 1939, but had to be postponed due to the war. Under C.G. 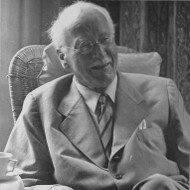 Jung's guidance, and with a minimum of overhead, a post-graduate training program in psychotherapy started up on the Gemeindestrasse 27 in Zurich-Hottingen. In 1953 the first diplomas were awarded to three graduates, two men and a woman. In the following years, the Institute gained worldwide recognition, drawing a growing stream of students, especially from the USA, eventually crowding the facilities beyond capacity. 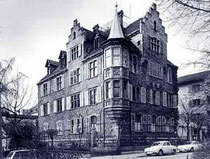 Thanks to a stroke of luck in early 1979, a new home for the Institute was found in Küsnacht, where Jung himself lived until his death on June 6, 1961: the "Seehof" on Hornweg 28. Through a rental contract, the commune of Küsnacht made available this historic residence with its attractive gardens on the shores of the lake of Zurich. Built in the late 15th century, this house was the residence of the poet Conrad Ferdinand Meyer between 1868 and 1872, and has since become a site of historical preservation. Meticulously renovated in1978, the Seehof is a proud architectural gem with stucco ceilings, ornate wallpaper, and decorated tile stoves. The Curatorium, which administers the Institute and serves as the foundation's board of trustees, dates to 1948, when it was assembled by the physicians Prof. C.G. Jung, Prof. C. A. Meier, und Dr. Kurt Binswanger, as well as Dr. phil. Jolande Jacobi-Székács, and Dr. phil. Liliane Frey-Rohn.